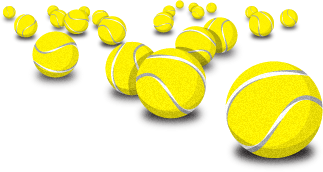 Brian Teacher Tennis Academy is a high performance junior tennis training academy in Southern California. 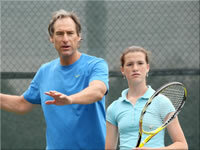 Learn from one of the most renowned tennis coaches in the country! Fewer kids per tennis court. Programs for college-bound tennis players and pro tennis players. Technical training, strategy, game play and point construction. Only the most dedicated need apply. 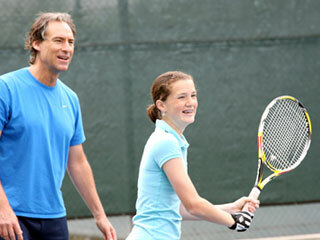 Brian Teacher believes in a small and intense ratio of kids to instructors—matching kids to approximate age and level—who are all certified USPTA pros and who understand Brian's philosophy of developing kids with a full court game who are technically sound. No matter what their style of play, all kids will develop all facets of the game for the fullest dimensions and potential. There are instructional sessions that incorporate drills to help refine technique and skills. These also will incorporate strategy and learning to defeat and play against different styles of play. There is also monitored game play for feedback on what is working and what needs improvement. The program is designed to be holistic and complete to get the student to the next level. 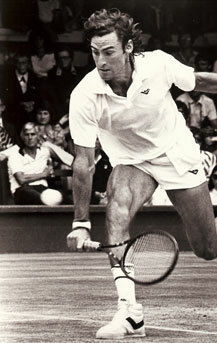 As a player, Brian was succcessful at all levels of competitive tennis from junior to collegiate and professional. Greg Rusedski. Rusedski turned to Teacher when he was ranked #85 in the world and had been on the tour for five years. Brian helped Rusedski learn to come over his backhand more, develop a more penetrating shot and be able to execute passing shots better. They worked on his net coverage and his ability to generate offensive volleys when stretched wide. He developed a much more comprehensive net game to accompany his big serve. They also improved his return of serve by improving his balance, split step and chip & charge. News article. With these improvements, Rusedski shot up the world rankings to the top ten in the world, reaching the U.S. Open singles finals in 1997 (after not having won a match in the previous three U.S. Opens) as well as the Quarterfinals of Wimbledon. News Article. Marissa Irvin Brian started with Marissa when she was 16 years old. At that time, she was unable to generate a lot of power with her shots. Teacher worked on her technique on both forehand and backhand with more loading and more resulting power. With Teacher's help, Irvin became the top junior player in the United States, receiving a scholarship to Stanford University. While at Stanford, Teacher continued to assist Irvin making periodic trips up to Stanford on a weekly basis. While at Stanford, Irvin reached the NCAA finals two years in a row in 1999 and 2000. After her college career, Teacher travelled with Irvin on the WTA tour where she reached a high ranking of #42 in the world. News Article. Max Mirnyi Teacher worked with tour workhorse Max Mirnyi from Belarus. Teacher improved Max's ability to take advantage of his big serve, by landing farther into the court, and being able to follow up the serve to the net. He also worked on being more aggressive and proficient with his volleys. Teacher helped him build his game style around his big powerful frame. Mirnyi reached the top 50 in the world in singles for 7 straight years, and became the #1 doubles player in the world. Mirnyi still competes on the ATP tour and is currently ranked #7 in the world in doubles and has over $8 million in career earnings. News Article. Grabb/Reneberg and Nestor/Knowles Teacher coached two #1 in the world doubles teams: Grabb/Reneberg and Nestor/Knowles. Teacher helped them understand & develop high level doubles tactics and help them all develop penetrating, crushing volleys as well as solid consistent return of serves. Andre Agassi Agassi approached Teacher to coach him in the early 1990s prior to Agassi winning his first Wimbledon. Agassi noted to Teacher that he seemed to be getting aced more than any other top player. 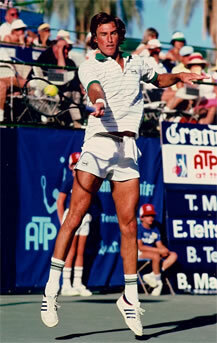 Teacher subsequently worked on Agassi's service return and trying to avoid quite so large a split step hop. News Article.